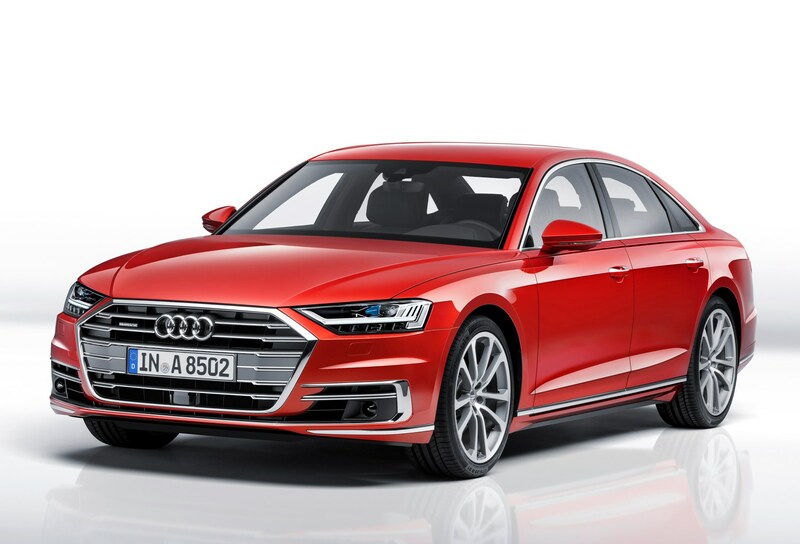 The fourth-generation Audi A8 luxury saloon is packed with the latest technology, and might well become famous for becoming the first European car to be launched with hands-free autonomous capability built-in. But there’s more to the A8 than this headline-grabbing tech – it needs to be given the strength of its rivals, BMW 7 Series, the soon-to-be replaced Lexus LS, Jaguar XJ, and especially the brilliant Mercedes-Benz S-Class. This means it will be available with autonomous driving technology thanks to what its maker calls Audi AI. As well as this, all models are hybrids, you can buy it with self-parking technology, and its interior is bang up to date with the latest equipment after falling behind the Mercedes-Benz S-Class in the technology arms race. 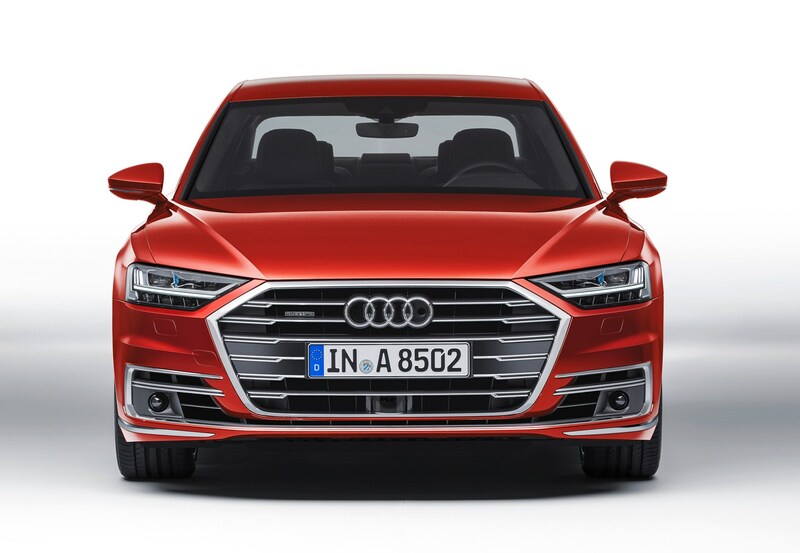 Before we get to its piloted-driving technology, it’s worth pointing out that the 2018 Audi A8 marks an evolution of the company’s well-established design direction. So, the body features a raft of sharp styling touches and a more angular version of the company’s signature grille. 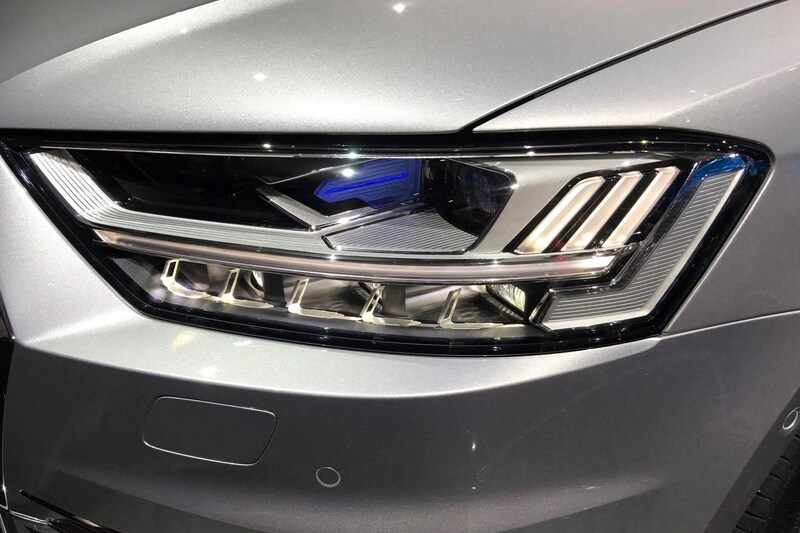 That’s flanked by laser headlamps, with a full-width OLED set-up for the rear lights. Inside, the dashboard has been tidied up, with a dual-screen set-up that’s highly integrated, and both responsive and fully-featured. Some will denounce the decision to move all of the climate control systems into one of the screens – but it is a logical layout, and easily mastered, especially given the Haptic feedback system that makes the onscreen buttons feel like physical ones. 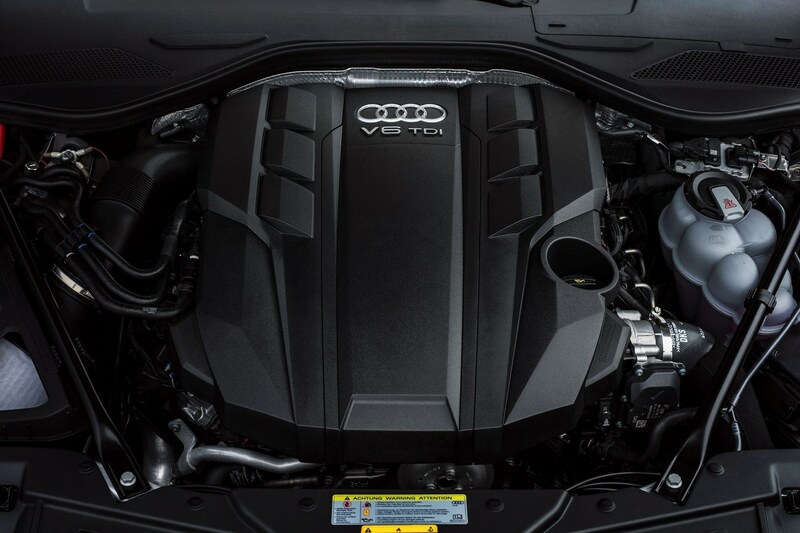 The A8 will initially be powered by a pair of V6 engines – a 3.0-litre TFSI turbo petrol with 286hp and a 3.0-litre TDI turbodiesel with 340hp. But the range will expand to include a V8 diesel and eventually a W12 petrol. Both engines are described as 'mild hybrids,' in this instance meaning they can coast with the engine off and have extended stop-start intervals. But Audi has also confirmed that an E-Tron plug-in hybrid version will follow with a 31-mile battery range and wireless charging capability. What is the Audi AI system? Essentially this is the core of what will manage the piloted drive system as Audi approaches Level 3 autonomy. This will include allowing the car to take control during traffic jams (using traffic jam assist) and motorway driving, operated by the push of a button. 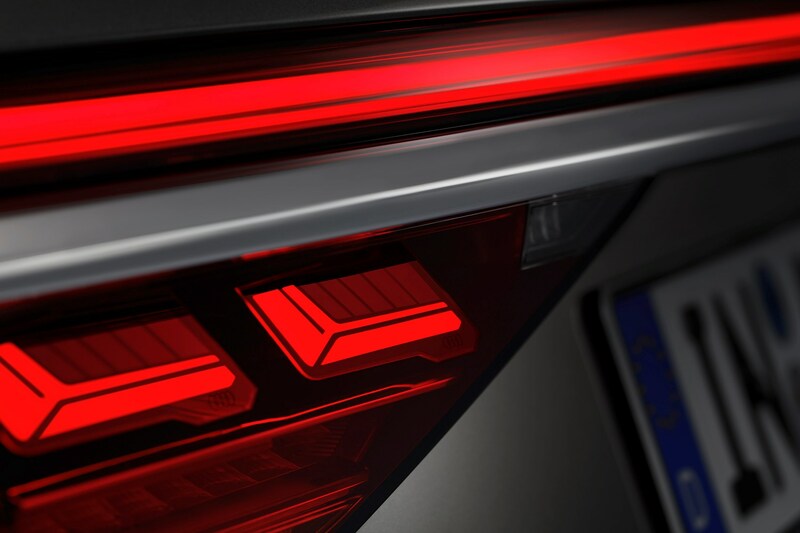 There are a number of sensors that inform the system, including cameras, Lidar and – a first for Audi – laser. Traffic jam assist takes over the tedious task of stopping and starting in queues, and will operate up to 37mph – controlling acceleration, steering and brakes. Unlike the current adaptive cruise fitted to the top-of-the-range Volkswagen Group products, you won’t need to intervene to set off from a standing start after coming to a halt. To ensure the driver doesn’t fall asleep at the wheel, there’s an interior camera that monitors the driver’s behaviour, and will jolt the seatbelts to ensure they’re paying attention. Audi says that autonomous driving will be rolled out in 2018. 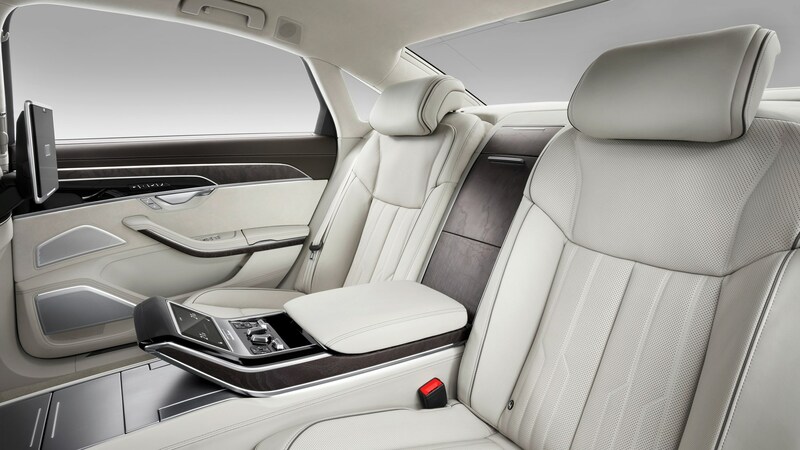 What other technology do you get in the Audi A8? Where to begin! There’s a remote parking system, so the driver can swing their A8 into a parking bay without even being sat in the car. It works using the car’s cameras and a smartphone to control its movements. Finally, the car’s navigation and infotainment systems are in constant touch with other cars via an information cloud, and can instantly provide warning of upcoming issues, such as crashes and bad weather on the road ahead. This so-called car-to-car or car-to-x capability is in addition to the usual connected tech that provides traffic info via mobile networks and wifi. 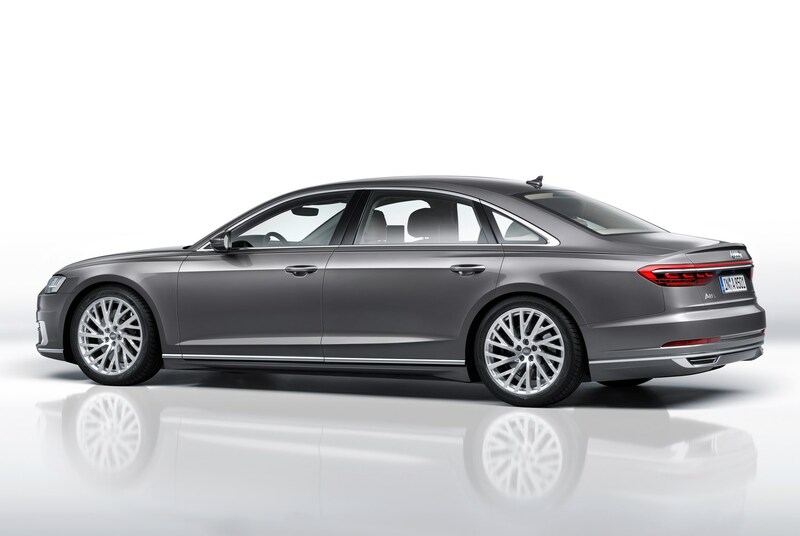 Air suspension is standard on all models, but Audi AI control will be offered, adding active ride into the A8 package. The system scans the road ahead and compensates for rough conditions and sudden surface changes. 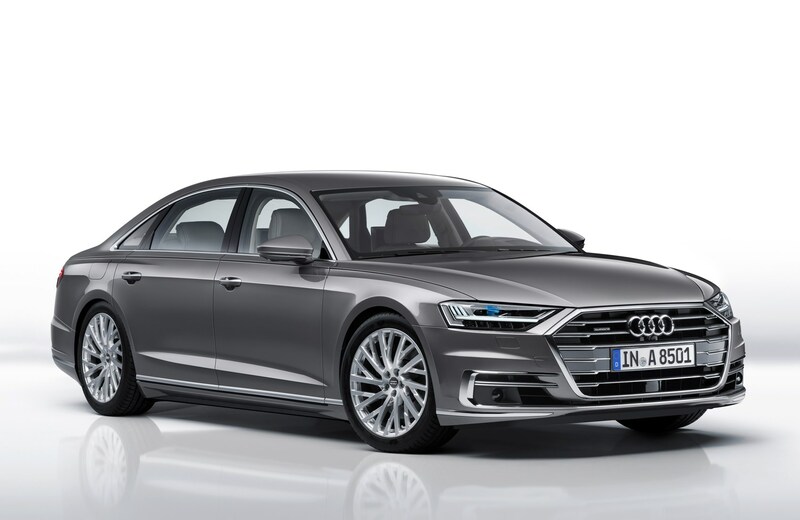 In fact, there’s so much tech that traditional 12-volt electrics won’t hack it anymore, and the new A8 comes with a far beefier 48-volt system across the board. What’s the Audi A8 like inside? It looks very different to the generations that came before. The dashboard makes extensive use of multiple displays – with the majority of functions and information being handled by a large pair of centrally-mounted touchscreens. The upper screen looks after the navigation and infotainment, while the lower one is dedicated to the climate control settings. In addition, Audi’s Virtual Cockpit system grows to its largest-yet iteration – and you’ll also be able to specify a head-up display. The seats are large and comfortable, with plenty of storage space in and around the front of the cockpit. Rear-seat passengers get the option of being able to recline, as well as get their own screens to control various functions as well as watch TV or another video source. There’s even an optional foot massager. Yes, really. 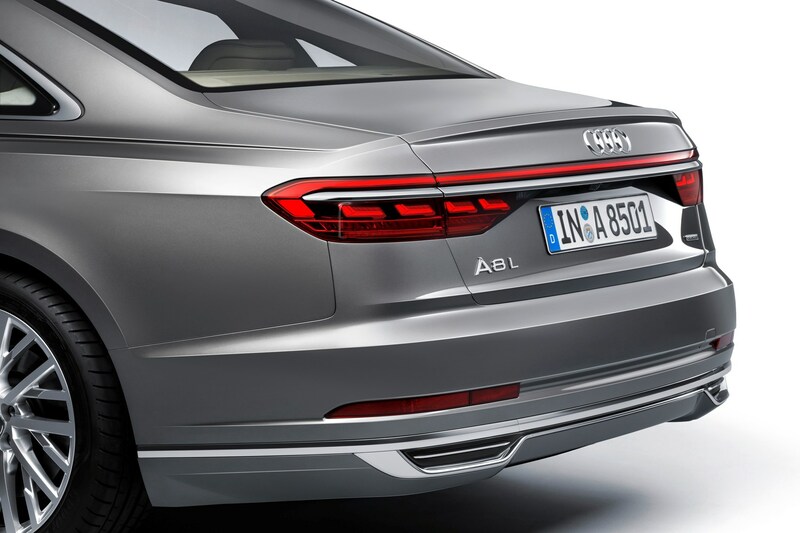 The latest A8 comes in standard- and long-wheelbase forms, with order books opening in September 2017 ahead of UK deliveries from early January 2018. At the time of writing, the range started at £69,100. 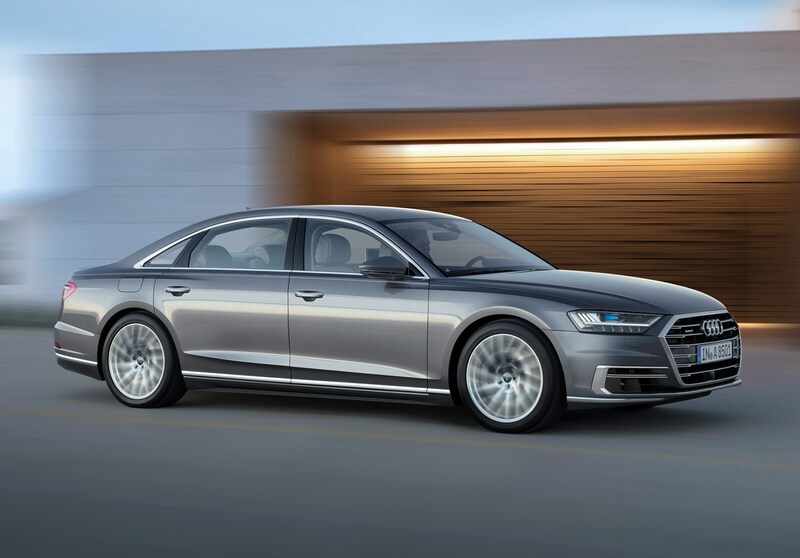 The Audi A8 delivers everything expected of it as the company's flagship, and as a great car for drivers and – more importantly – passengers. It has more rear room than before, has more tech, and delivers increased efficiency. In short, it should continue to satisfy those who are looking for the ultimate Audi limousine. Particularly notable is the move to a much more digitally-integrated dashboard. You'll either love it or hate it – but there's no denying that it looks amazing – and is functional, too. To drive, it's a triumph. Its air suspension adds smoothness and refinement, while the all-new active (and optional) set-up adds a degree of body control previously unseen on any Audi. 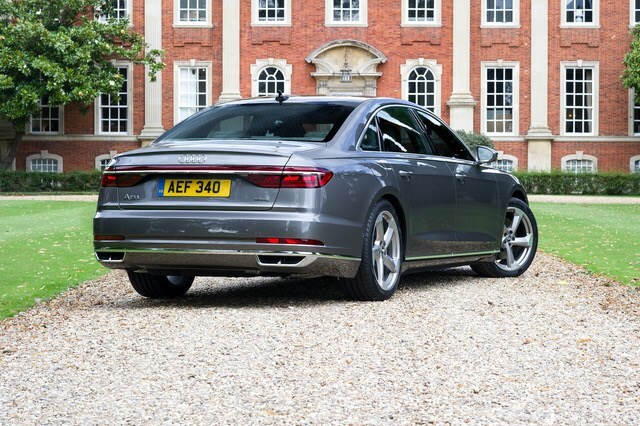 Forget the headline-grabbing autonomous announcement, and the fact it's not available with a plug-in hybrid version from launch, simply put, this is a great car – and puts Audi back at (or very near) the top of the luxury class.